Now that we’ve been in Whangarei for almost two months, one of the most impressive things I’ve noticed is not just how friendly the people are but also how trusting they seem to be. For example, in order to get our propane tank filled it had to be certified to meet New Zealand standards. So I took it to T & L Industries where Charlie said he could have it done in a few days. I gulped as that meant going without propane for that period of time. Charlie said, “No worries, mate. You can borrow this tank until yours is ready.” And he handed me a tank, certified and full of propane. One of the first things we did when we got to Whangarei was to get our refrigeration fixed. I called a local company and they dispatched their technician, Warwick. Pleasant, thorough and good natured, he got to work right away. The problem turned out to be elusive but after coming and going a few times he got it fixed. About ten days later I got a call from his office asking me if I’d like to ‘pop by’ and pay the bill. A similar sequence of events just occurred for some work that an electrician did for us. Consistently I’m finding people going out of their way to help, to point me in a direction that can better suit my needs or might be a better value. Perhaps I’ve been jaded from living in Southern California for so long that I’m suspicious of most people that I’m doing business with. However, here I’m starting to let my guard down. Very funny story. 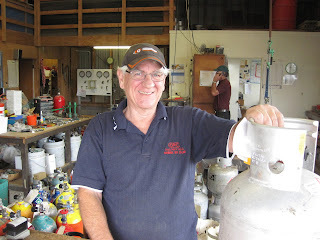 Jim on Galatea had the same appreciation of the quality of work he got in NZ. Hey - people here still asking about Rutea. Last folks: SV Tamara. Skipper Dave said: are you the much older brother of Neal?? ?